It has been more than 1 year since my last update. Many reasons, the biggest: our son entered our life one year ago. Shall I say more? Last September my friend Domitilla, coming back from her home town Mondragone, brought us some wonderful organic lemons, directly form her mother’s tree! Is there a better use than preserve them in salt? Sure no! The lemons where ready after 2 months, but only recently I had the inspiration to use one in this classic moroccan dish: a Tajine with home made pickled lemon. Halve the chicken tights with a sharp knife. Wash and cut the courgette in thick sticks, as big as your thumb (in the picture you see them bigger than I just wrote: I find that cutting them as big as your thumb makes them more tender in less time). 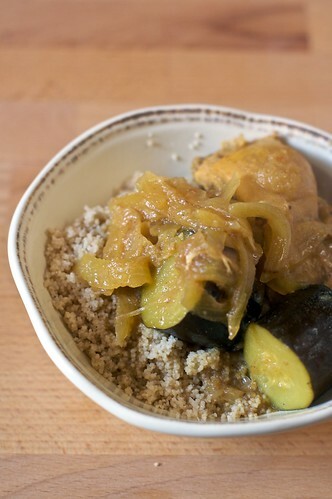 Heat the oil in a tajine dish or in a heavy, sturdy and big saucepan. Gently fry the onion, add the spices and meat and let it brown. Add the courgettes and the citron, cut in chunks. Stir and add enough wanter to cover it. Let it cook on a low fire until all the ingredients are tender. If you don’t have pickled lemon, or you cannot find them anywhere, do not despair: use a normal lemon! 🙂 Jamie Oliver explains the same recipe (well, more or less the same… he also uses citron confit) in his TV show about Moroccan food and traditions.